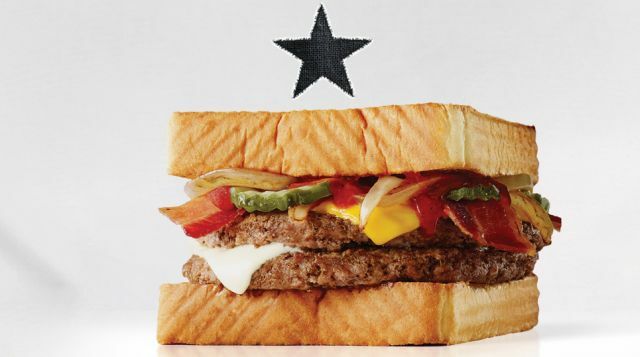 McDonald's now offers a new Texas-exclusive burger that's served on Texas toast called the "Lone Star Stack." The burger features two beef patties, sweet onion barbecue sauce, grilled onions, Applewood-smoked bacon, American and white cheddar cheese, and crinkled pickles between two slices of Texas toast. It came about as the result of a crowd-sourced create-a-burger contest back in March. The winning burger was designed by Joseph Pena of Houston and selected by a panel of community influencers, McDonald's Texas owners and employees. The contest followed a similar competition by McDonald's last year in the Chicago area. According to the chain, most of the entrants were "spicy, large, and, of course, loaded with bacon." The Lone Star Stack is available at participating Texas locations through August 28, 2016. Participating markets include: Austin, Beaumont, Bryan College Station, Corpus Christi, Dallas, El Paso, Harlingen, Houston, Laredo, Midland-Odessa, San Antonio, and Waco.